Full range of embedded computing Solution fulfill your business needs which can adapted in any harsh environment for special application. There are Full IP65 box PC, 4U Rack PC, EAC Box PC, fanless and standard fan Box PC, and 1U rack Server , Intel NHIG Box series as our embedded computing top list products. The "Embedded Automation Controller" (EAC box) which is special designed for transportation application. This embedded system is the central platform with Intel Core 2 Duo 945GME built-in processor for embedded computing to communicate with the electronic devices in vehicles. The most unique design for us is this solution is with power and serial signal isolation and well heat dissipation. Furthermore, this solution meet the DNV type approval requirement to fit in various environment for transportation purpose. For the harsh environment application, we design Full IP65 Box PC, which all I/O ports are fully sealed for outdoor uses. Integrated with Intel Atom N270 1.6 GHz processor, this solution provides ultra low power consumption, low heat for fanless design withstand the temperature from0~55°C surrounding environment. low power consumption, rugged compact design which is suitable for rugged and limited space environments. The 1U Rack server is the best solution for cloud computing, the space saving rack design using in business IT system, and provides businesses for storage, security , application processes, testing, enterprise software, and complete platforms, all business demands. The 4U Rack PC is embedded Intel Core 2 Duo Chipset which have ultimate performance for industrial grade and rugged environment application. The main features for this Rack PC are capable to support up to 14 PCI interface add-on extension cards, which brings huge extended flexibilities to meet your business and application needs. And in front side of the mechanical , we have lockable housing design to prevent the unauthorized access. To learn more about this solution, please connect to the website. 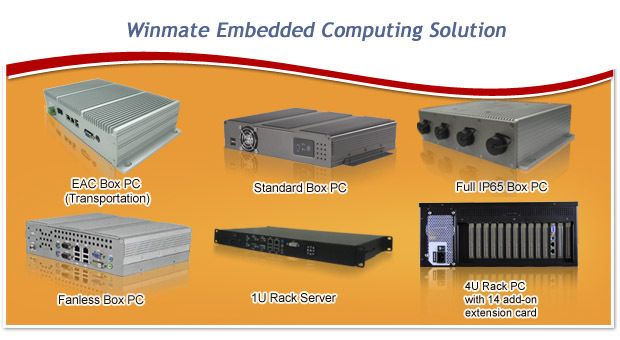 Winmate have professional modularized system design, for PC board layout, 3D Housing, thermal simulation. We are able to realized complex requirements with just few months into the brand new customized products. Welcome you are part of our success soon.